Whilst requesting and submitting payments for Stage Claims recently, you may have noticed a few small changes within RAVE. These changes have been implemented as part of an aesthetically pleasing update where we have seen the “Edit” button replaced by a pencil icon, and the delete button has been replaced with a red “X”. These simple changes have been made to ensure your navigation throughout RAVE is as smooth and easy as possible. These visual changes have been accompanied by a few others too. After requesting a stage claim payment in the Stage Claims tab of your Project, within the Site/Build section, the stage is now marked as “Due”, instead of “Paid”. This change removes any chance of confusion for you when navigating RAVE, as we all know invoices aren’t paid immediately after request! 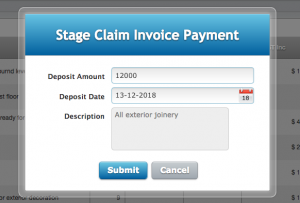 In a similar change that keeps RAVE more in line with the different accounts systems used, the “Paid Invoice” pop up has been renamed to “Invoice payment” and the “Stage Claim paid Invoice” pop up now displays as “Stage Claim Invoice payment”. RAVE now gives you the ability to issue receipts. Once a stage claim is submitted as “Paid”, a PDF receipt is generated in both the branch and client login. This is accessible from the stage claims tab and is found by clicking on the Adobe Reader icon. It’s worth noting that while all of the project and branch details displayed on both the Invoice preview and the Receipts will be pulled straight from the details loaded into Rave, the GST number on the receipt will only display if you have added your branch’s GST number into your RAVE profile. This can be completed by heading to your profile and entering your GST number in the “Settings” Tab. For a complete view of all the technical updates and tweaks that have been made to RAVE recently, check out the Technical Updates section of our blog.